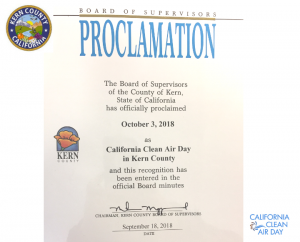 The Kern County Board of Supervisors have declared Wednesday, October 3, 2018 as California Clean Air Day. CommuteKern, a program of Kern Council of Governments (Kern COG) has joined with local businesses, agencies and nonprofits to celebrate California Clean Air Day in Kern County. California Clean Air Day is a statewide project of the Coalition for Clean Air. They seek to have 1 million individuals, government entities, and communities pledge to take action to clean the air to improve health and wellbeing for years to come. Jose Gurrolla, Mayor for the City of Arvin immediately responded to the request from the Coalition for Clean Air, pledging to do what he can to improve air quality. CommuteKern hosts Rideshare Week, October 1-5, 2018. Individuals who pledge to travel by riding a bike, taking a bus, carpool or vanpool on one day during rideshare week can visit www.commutekern.org to be entered to win a bike from Snider’s Cyclery. More than 60 businesses throughout Kern County participate in this popular annual event. On Saturday, October 6, 2018 clean air day events will take place at Yokuts Park, 4000 Empire Drive in Bakersfield between 10am and 1pm. Nonprofits, food trucks, and dealerships with electric and hybrid cars have been invited to participate. Bike Bakersfield will host a family bike ride on Saturday, October 6, 2018. Cyclists may gather as early as 9am at the Bike Bakersfield office, 1708 Chester Avenue, Bakersfield. At 9:30am they will ride 2.5 miles to Yokuts Park. Ride participants will join the clean air festivities planned at the park. Bike Bakersfield will talk about Bikes and the Environment. Kern Transit plans to demonstrate how to properly load and unload your bike from a transit bus. Tree Foundation of Kern will celebrate its 25th Anniversary with a special tree planting event at Yokuts Park, beginning at 10am. The public is invited to shovel soil onto a 48” box Oak tree and to help planting a few 24” box trees. Children can help by moving grass. The Tree Foundation will give a talk about Trees and the Environment. The Kern County committee for California Clean Air Day includes representatives from Southern California Gas Company, CommuteKern, Project Clean Air, Bike Bakersfield, the Tree Foundation of Kern, Kern Transit, Valley Clean Air Now (Valley CAN), local air districts, and the Coalition for Clean Air.